My own children wrote before they read. When they were 3 or 4 years old, they wanted to write their name or label a picture they had drawn or help with the grocery list. 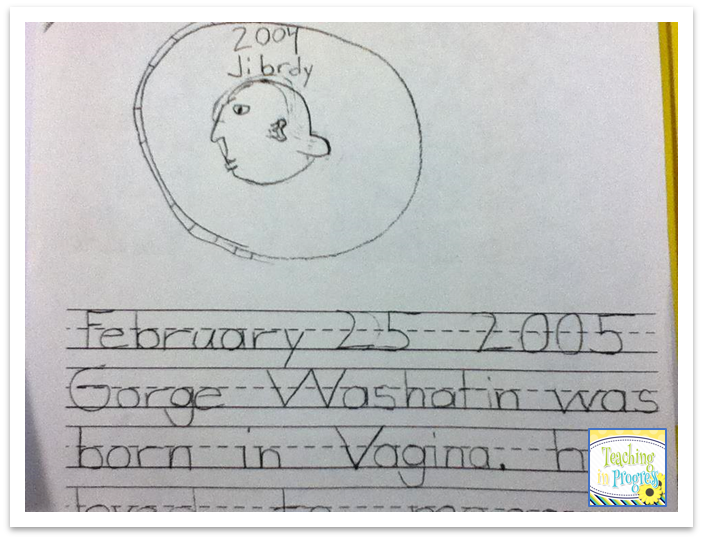 Since they already knew letters and most sounds, they used invented spelling to try to get a word on paper. All before they could read a word. Watching this unfold was a profound experience for me as a teacher. As a teacher, I can only see a small portion of a child's learning begin to unfold, and I see the same short, 10 month portion of development year after year. It's like watching tadpole after tadpole grow two back legs, but never seeing the frogs leap from the pond. But as a mom, I got to see the whole process from the very start. And it was amazing! The connection between writing and reading that I saw my own preschoolers make at home was the connection I wanted my students to make at school. Unfortunately, at that time, the educational pendulum was swinging away from a language arts program which included a balance between phonemic awareness, phonics, literature, and writing. Everything was chopped up into separate bits and taught in isolation. Ugg! Reading and writing is a complicated matter, but kids really need to make their own connections and discover relationships between sounds, letters, words, and writing in their own way. That requires that kids get to play and explore with reading and writing outside of he implicit instruction they receive during lessons. Peanuts. Maybe we should have worked a bit more on ending sounds. Translation: You shouldn't have scared Goldilocks like that. 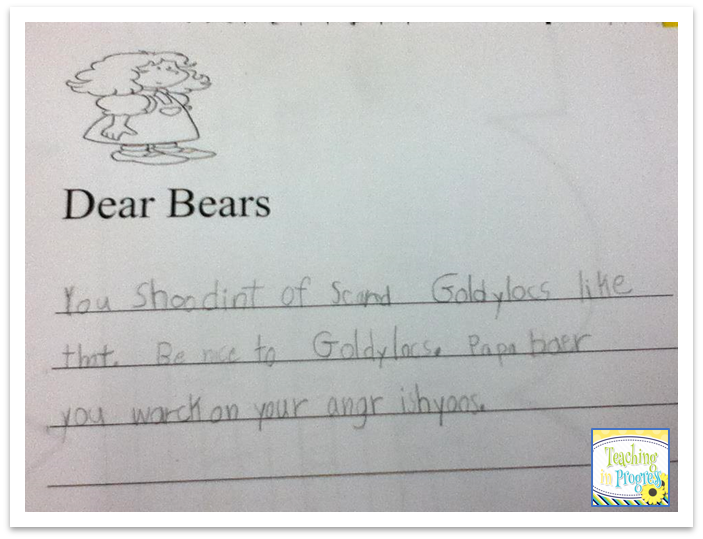 Be nice to Goldilocks. Papa Bear, you should work on your anger issues! Haha! 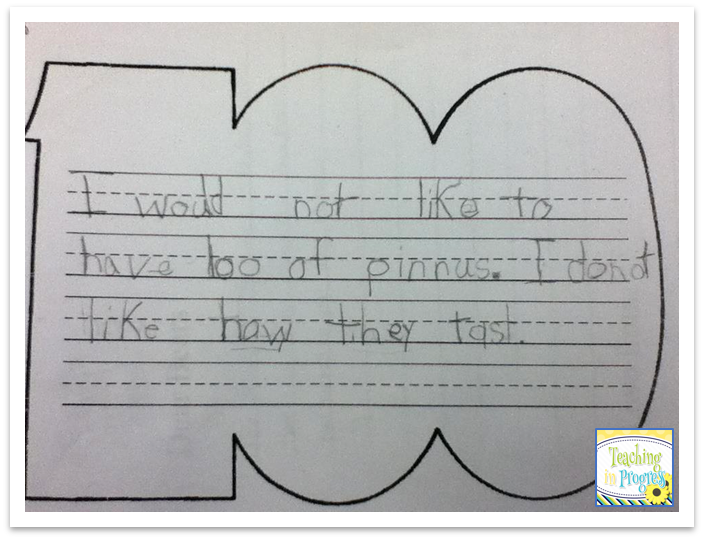 I love reading their writing. Always a good laugh! Those are funny, thanks for sharing!